NOTE: The battery box ventilator voltage must be matched with the voltage of your battery bank. The Zephyr battery box ventilator is designed to move hydrogen gas out of your battery enclosure when the batteries are gassing. When flooded lead-acid batteries are charging, they give off hydrogen gas. If your enclosure does not have adequate ventilation, the hydrogen gas can collect inside the enclosure and cause an explosion hazard. 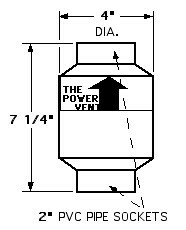 The vent fan is generally used with an auxiliary relay as found on the Outback inverters and controllers.